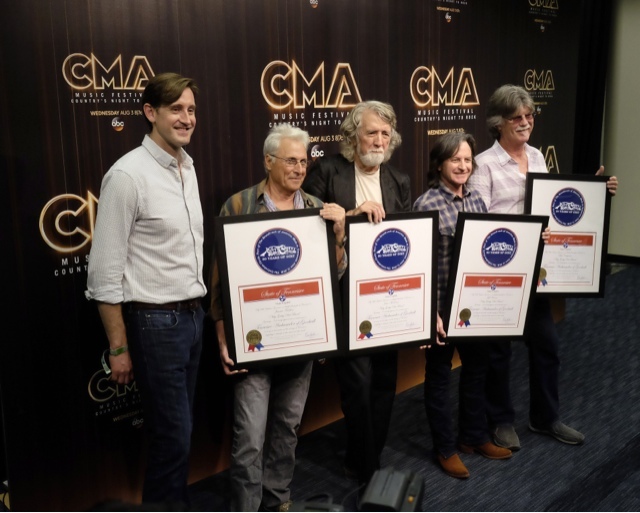 NASHVILLE, Tenn. (June 13, 2016) – In Celebration of The Nitty Gritty Dirt Band’s 50th anniversary, the Tennessee Department of Tourist Development honored bandmates Jeff Hanna, Jimmie Fadden, Bob Carpenter and John McEuen with special commemorative art pieces that included official Tennessee Ambassador of Goodwill certificates signed by Gov. Bill Haslam. The special presentation took place at Nissan Stadium during CMA Fest, just prior to the band’s debut performance at the stadium. Brian Wagner, assistant commissioner of marketing, Department of Tourist Development, made the presentation to each member of the world-renowned group. This is not the first acknowledgement Tennessee Tourism has shown for the group, as the department recently supported the group’s star-studded televised PBS Pledge Special, a project that has reached more than 267 million viewers across the country. The show, filmed at the historic Ryman Auditorium, features guest artists including John Prine, Sam Bush, Vince Gill, Jerry Jeff Walker, Alison Krauss, Rodney Crowell, Byron House, and Jerry Douglas as well as former members, Jimmy Ibbotson (long-time member for decades) and Rock and Roll Hall of Famer and early NGDB member Jackson Browne. The Nitty Gritty Dirt Band has a full slate of dates commemorating the 50th milestone to run through the end of 2017, with many additional dates to be announced. Plans are extensive with select shows featuring special guests as well as many new exciting show elements. For more information, visitnittygritty.com or follow them on Facebook, Twitter andYouTube. June 17 - Grand Casino Events Center - Shawnee, Okla.
June 18 - Southwind Casino - Braman, Okla.
June 22 - The Mountain Winery - Saratoga, Calif.
June 23 - Del Mar Fairgrounds - Paddock - Del Mar, Calif.
June 30 - Royal Gorge Bridge & Park - Canon City, Colo.
July 01 - Vilar Performing Arts Center - Beaver Creek, Colo.
July 02 - Fir Amphitheater - La Veta Pas - Alamosa, Colo.
July 03 - Fir Amphitheater - Alamosa, Colo.
July 08 - Hodag Festival - Rhinelander, Wis.
July 09 - Minnesota Zoo - Apple Valley, Minn.
July 15 - Shenandoah Valley Music Festival - Orkney Springs, Virg. July 24 - Ravinia Festival - Highland Park, Ill.
July 28 - Door Community Auditorium - Fish Creek, Wisc. July 29 - Vadalabene Center - Southern Illinois University - Edwardsville, Ill.
July 30 - Wayne County Fair - Wayne, Neb. Aug 06 - Lake Superior Big Top Chautauqua - Bayfield, Wisc. Aug 07 - Lake Superior Big Top Chautauqua - Bayfield, Wisc. Aug 13 - Crook County Fair - Prineville, Ore.
Aug 26 - Detroit Mountain Recreational - Detroit Lakes, Minn.
Aug 27 - Seven Clans Casino - Red Lake - Puposky, Minn.
Sept 02 - Honeywell Center - Wabash, Ind. Sept 04 - Central Wisconsin State Fair - Marshfield, Wisc. Sept 09 - The Strand Theatre - Shreveport, La. Sept 11 - Silver Dollar City - Branson, Mo. Sept 15 - Britt Pavilion - Jacksonville, Ore.
Sept 16 - Sonoma State University - The Green Music Center - Rohnert Park, Ca. Sept 22 - Reynolds Performance Hall - Conway, Ark. Sept 23 - Halloran Centre for Performing Arts - Memphis, Tenn.
Oct 01 - Anderson Music Hall - Hiawassee, Ga.
Oct 04 - Schermerhorn Symphony Center - Nashville, Tenn.
Oct 06 - Oxford Performing Arts Center - Oxford, Ala.
Oct 22 - The Majestic Theatre - Dallas, Tex. Nov 13 - MotorCity Casino Hotel - Detroit, Mich.